I was amazed to be nominated twice for this award, which is extraordinarily humbling. Not quite sure what I have done to receive such an accolade, but I certainly appreciate it. The sweet bloggers that nominated me were: Sage Doyle and Morrighan (The Enchanted Solitaire). Please do visit their blogs, as they are both amazing in their own unique ways. Sage Doyle is a beautifully gifted word-smith and poet. Morrighan is so inspiring and generous; her empathy and understanding cannot go unnoticed when reading her wonderful blog. Which means that you can check out your favorite blogs, and even if they have already been given the award by someone else, then you can still bestow it on them again and help them to reach the maximum 6 stars! Why have I nominated these? Because they are all generous with their knowledge and wisdom, and their blogs and writing continue to inspire me. So, if you have a minute, go and check them all out. 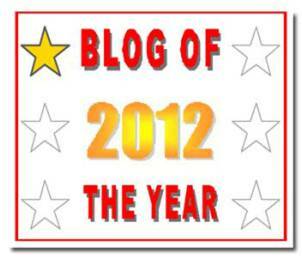 This entry was posted in On My Travels and tagged award, awards, blog of the year award. Bookmark the permalink. wow…Awards season is upon us! I thank thee, sammiwitch with my deepest curtsey! You’re so funny! Your sense of humour – and court etiquette – have me in stitches. thank you, kindly, your ladyship! Thanks so much for the nomination Sammiwitch! I spent most of last night trying to work out how to put the award on my sidebar. Still none the wiser. Seems like I only just learned how to send an email. The I.T. guy where I used to work called me Anthonyosaurus. Yes I think you’re right. Hopefully I can put it underneath though. Thank you so much for saying that I deserve it; it has put my mind at ease. I often feel like I have pinched these awards from others who in my mind have more right to them! Yes you definitely deserve it, give yourself some credit 😉 And that would be so awesome lol Sage Doyle, Word-Smith. Brilliant! Thank you sweetness witch. This would be my second. You are sunshine and moon beams. All well-deserved, I’m sure! ;-) And you are like fairydust – you sparkle! That is so lovely, thank you. What a lovely thing to say – you have made my day – thank you.